We all love including our pets in selfies. We share the photos and we use them on Christmas cards. But what happens when Fido won’t look at the camera? Time for a dog selfie stick like this one. Pooch Selfie is the original dog selfie stick. It even comes with a squeaky ball to really get your dog’s attention. It seems like such a simple idea that it wouldn’t even be worth bothering about but it really does work. This Pooch Selfie device makes it so much easier to take photos of your dog. And it works for both cameras on your phone. You are not limited to selfies. You can use the forward facing camera on your phone to take pictures of your dog easily whether you’re in the backyard or out and about. This dog selfie stick is designed to not cover either of the camera lenses on your phone. If you need to check details on which models it is compatible with, click here. If you’ve ever struggled to get your dog to smile for the camera instead of licking your face or looking in another direction then you’ll love this Pooch Selfie. When it comes to dog gifts this one will be enjoyed by all. You can even use the removable ball to reward your dog for taking a great selfie. 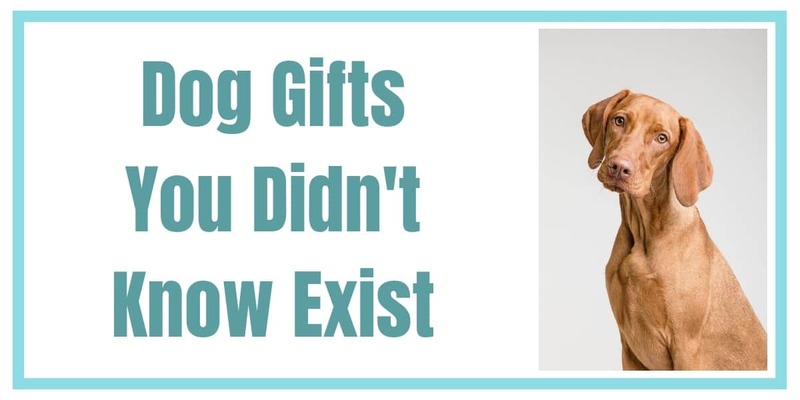 If you’re looking at dog gifts, you probably want something that your dog will really like. Dogs go crazy over these bacon flavored bubbles. Don’t worry about your dog getting bored, these bubbles will keep your pooch running around chasing bubbles for as long as you leave it on. The advantage to you is that your dog is getting exercise and using up energy while you get to relax. This is genius! This Bubbletastic Bubble Machine comes with one bottle of bacon bubbles. These bubbles are non-toxic and tear free. They are safe for dogs and kids. They are bacon flavored and your dog will love them. If you need to buy replacement bubbles, you can get them online, click here. 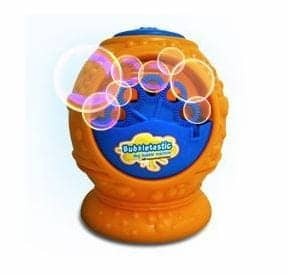 You get plenty of bubbles produced from this bubble machine. You dog will love it. This may be the best gift your dog gets. Don’t forget the batteries. You’ll need to buy 4 AA batteries to go with it (they are not included). I’m not sure that your dog will think this is the best gift, but it will certainly be loved by you. It’s not that your dog will hate it, he will actually rather like the attention of you using it on his paws but as a gift it may appeal more to you than your dog. Although when it comes to dog gifts, this one will be loved because you’ll be happy to let your dog outside to run in the mud. This is a portable dog paw cleaner that will keep mud out of your house or car. It is available in 3 sizes for different sized dogs, click here to see the details. If your dog loves to run outside after rain this will help you keep everything clean. You can keep it by your door or in your car and use it to clean one paw at a time. It is quick and simple to use. Simply place one paw in the paw cleaner, twist it and and then take the paw out and dry it. You can do this for each paw and be finished quickly. You’ll save yourself a muddy mess in your home. If you’ve ever spent time trying to use several different towels to remove the mud between your dog’s toes, you’ll appreciate this Portable Paw Cleaner. It does a great job at removing the mud and it does it easily. Surprisingly, most dogs seem to tolerate it really well. It must be like a foot massage for them! I just love this mane! It’s so realistic. If you have a medium to large size dog then this mane is perfect. Want to scare the postman? Want to freak out the neighbors? This mane looks so realistic you’ll be laughing at people’s reactions non-stop. This is a great gift idea for your dog for the holiday season. Or get one of these for Halloween and let your pet join in the costume fun. If you’re a Labrador owner and you’re stuck on ideas for dog gifts, you need to get one of these magnificent manes! Have you given your dog a Flipboard yet? These are great for giving your dog mental stimulation. If your dog is getting bored at home, try one of these puzzle toys. These make great dog gifts for your own dog or as a gift for a dog parent you know. You get the hide the treats under the pieces and your dog will enjoy moving, flipping and lifting the pieces to get the treats. This is lots of fun for your dog to do and for you to watch. The challenges include sliding disks to the side, flipping lids using knobs and lifting up cones. The cones are designed so that they must be lifted rather than knocked over. This increases the challenge for your dog. Dog gifts come in all shapes and sizes and this one will certainly engage the mind. You can vary the number of treats to keep it interesting for your pet. The base includes a non-slip rubber ring for stability. You’ll also get a booklet with tips and tricks for optimal training. The Flipboard is dishwasher safe for easy cleaning. If you don’t already use this Paw Protection product, you really should consider getting it for your pet. This protects against hot pavement, sand, ice and salt. It is perfect all year round. Your dog will thank you for it when his paws are protected from harsh environments. This paw protection is like an invisible boot that protects your dog’s paws. It is perfect for any outdoor activity like mushing, hunting, hiking, camping or just enjoying the backyard. If you’re looking for dog gifts, this is a great stocking-stuffer for your pup these holidays. But don’t wait for the holidays to use it. Remember to apply about once a week or as needed to protect your pet all year round. You may be using a slow feeder bowl to slow down your dog’s eating. This snuffle mat is similar in that it slows down eating but it also provides plenty of opportunity to encourage your dog’s natural forage instinct. This snuffle mat puts your dog’s nose and brain to work to seek out the treats within the snuffle mat. It is easy to use and easy to clean because it’s machine washable. This snuffle mat is a good gift for any dog. It suits any size or breed and keeps them entertained. Dog gifts can sometimes be hard to find but this mat suits all dogs. If you have a Bulldog, Boston Terrier, or Pug and they find it difficult to use a puzzle board, try a snuffle mat instead. They work for all dogs because they’re soft and flexible and they don’t require a long snout. Similar to a puzzle toy, you shouldn’t just leave this out for your dog to play with all the time. It should be used with treats and then removed. If your dog is a chewer, you’ll need to supervise. This is not a chew toy, it is a snuffle mat for treats and should be kept for that purpose once or twice a day. This is a good idea for any age dog, but if you have a puppy it’s good to train them to use a dog doorbell while they’re young. These Dog Doorbells are high quality extra large bells that are loud enough to hear when your dog rings them. You save your door from scratches if you use dog doorbells. And you don’t need to make your dog bark to let you know he needs to go outside. The bells are a nice way to communicate. The length of the strap is made from heavy duty nylon material to be durable. You get two different snap points so you can adjust the length to suit the height of your door and the size of your dog. If you’re thinking about potty training with a dog doorbell this is a good quality product. And if you’re looking for dog gifts as stocking-stuffers, this one is going to work for everyone. ⇒ Are you looking for the best Slow Feeder Dog Bowl? See here. ⇒ Want the best toys and games to keep your dog busy? Take a look here. ⇒ Need a Dog Stroller? See all the details yo need here.